"Turbo Download Manager (v2)" is a multi-threading download manager with built-in support for downloading media and image files. The extension is capable of getting remote files in parallel segments to increase the downloading speed. Also, there is an internal interruption control to resume downloads on slow or bad-quality networks. This extension offers a complete download manager user interface and well as download observer and multi-threading supports all in a single package. For the extension to support multi-threading, your browser needs to support FileSystem APIs. If these APIs are not yet supported, the extension redirects your downloading jobs to the internal download manager. 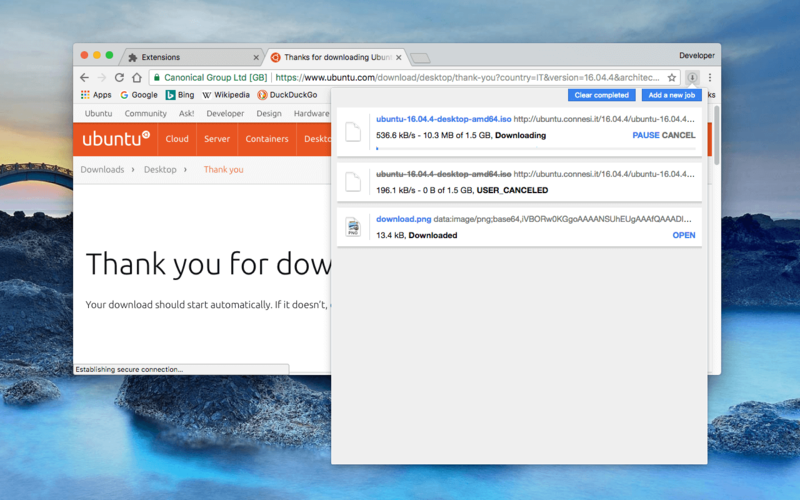 What is the "Turbo Download Manager (v2)" extension? This extension has four main modules: 1. Download manager popup (to monitor downloading jobs initiated either from this extension or from the built-in download manager). 2. Download dialog window (to add multiple links and to collect images from the opener tab), 3. Multi-threading internal module (downloads.js) to handle multi-threading jobs. 4. Download observer module to monitor video and audio sources that are requested by each page. To monitor ongoing downloading jobs from either this extension or the built-in download manager click on the toolbar button to open the popup. From this popup, you can pause and resume all downloads and see the number of segments for multi-threading jobs. Note that this is the only place you can monitor and stop multi-threading jobs. No multi-threading job appears in the default download manager of your browser until it is fully fetched. To request new downloading jobs, you need to open the "Download dialog window" which can be accessed either from the "Download manager popup" or from the right-click menu item over the toolbar button. This window can be used to initiate multiple downloads simultaneously with a custom number of threads. Note that if a single thread is selected for a download, this extension redirects the request to the internal download manager (there is no advantage of getting a single-threaded file with the internal "downloads.js" module). So to initiate a file with the built-in download manager simply reduce the number of threads to one. You can define the default thread sizes for image, audio and video formats from the options page. How does the multi-threading work? When a new job is requested, the extension inspects the server and ensures the multi-threading is supported by the server. If the multi-threading is not supported, your download will be handled by browser's built-in download manager. Otherwise, the total size of the file is calculated and then the file is split into different segments. Next, the extension asks your browser to allocate the same disk space locally. If this space is available on your system, then all segments are initiated one by one. When all segments are completed successfully the file is moved from the internal storage to the user's defined Downloads directory. This step is handled by your browser built-in download manager (copy the file from internal storage to user's Downloads directory). This helps the browser to track the downloads that are handled by this extension so there is no internal module to handle user's history! Also, other extensions can access the downloads history like normal downloads. Note that in oppose to the built-in download manager, the temporary file is not being created in the Downloads directory since the extension has no access to this directory. Instead, the internal storage is used. Note to the Firefox users: at the time of writing this documentation, Firefox browser still does not support "FileSystem" APIs that are required to handle file creation and segmented writing. This extension has a wrapper module to use "IndexedDB" APIs but this method is not efficient so it is disabled. As soon as the "FileSystem" APIs get supported by Firefox, the extension automatically uses them and multi-threading will work. How can I add a new downloading job? You can add a new job from either right-click context menu over a link, video, audio or image element or by adding the actual downloadable links to the "Download dialog window" which can be accessed from the right-click context menu over the toolbar button. When a download is added using "Download dialog window", you can customize the number of threads for each job individually, however, when a download is initiated with the context menu items, the default threading number is used based on the mime type of the link. How can I download all images on a page? First, switch to the tab that you want to grab images from. Now open the "Download dialog window" from the right-click context menu over the toolbar button. There is a button in the UI to search for images loaded in the opener tab. Click and wait until all images are grabbed. You will see the list of all images in the UI. Select those images you want to download and press the "Download" button. How can I download all media (video and audio) files from a single page? This extension has an internal module to track all media sources in a page. You can see the number of detected sources in the badge area of the toolbar button (for the current tab). If the "Download dialog window" is opened from a page with the badge number, all the detected sources will be listed in the window. If a page has multiple sources and you are confused how to get the last media link, first right-click on the toolbar button and press the "Reset" item. Now start the track that you want to have access to its source. when the toolbar button badge text is updated, open the "Download dialog window". What is the meaning the toolbar badge text? How can I monitor my downloading jobs? You can left-click on the toolbar button to open the "Download manager popup" view. In this view, all the downloaded files or in-progress ones are listed. This is the only place you can monitor multi-threading jobs as well are the built-in ones. What is the recommended number of threads? If the file is not too big, use two threads and if it is big use three threads.